The general narrative of the situation in Hamas-controlled Gaza is of a people under siege, deprived of everyday goods, whose only means of receiving sufficient supplies is through the network of tunnels that bring a wide range of essential items from Egypt. In fact, Israel delivers an average of 300 truckloads of goods each day through official crossing points to the Gaza Strip, basic supplies that provide steady, if unspectacular amounts of necessary items to the 1.6 million inhabitants of the Hamas-controlled enclave. The majority of everyday commodities as well as luxury items and, most significantly of all, drugs, explosives, and military hardware, come through the tunnels. They are run by a band including multi-millionaire Gazan businessmen often making vast amounts of money, and critically, paying taxes/bribes to Hamas to allow free passage of all goods. A senior Israeli Defense Force officer, speaking exclusively to the Investigative Project on Terrorism on condition of anonymity, explained why that continues. "Why don't Hamas pressure Israel to open more crossing points?" the officer asked. "The only crossing they insist that is open is Rafah, [the border between Gaza and Egypt], because that is a sign of sovereignty and is an international border crossing point between two countries. We are willing to transfer more goods at Nitzan crossing and Kerem Shalom crossing, but that is something they [Hamas] are not encouraging." 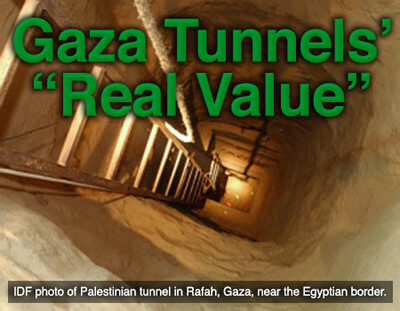 If goods flowed more freely into Gaza there would be no need for the tunnels. So it is in Hamas' interest to paint a picture suggesting a "population under siege" that would suffer without the tunnels bringing in food and goods. It's a story non-governmental agencies lap up and repeat throughout the world in their solicitations. The import of illegal weapons and contraband is rarely mentioned in that narrative. Last summer, 16 Egyptian border policemen were killed by Islamist terrorists based in Sinai who later managed to breach the Israeli border before being overwhelmed by a combination of Israeli Air Force and army units. This attack, understood to have included weapons that originated from the Libyan conflict of the previous year, was a wake-up call to Egypt's new Muslim Brotherhood government. Although it is Hamas' parent organization, the Muslim Brotherhood may recognize that it, too, is now a potential target for the weapons smuggled through Gaza's tunnels, some of which have been acquired by Al Qaeda-inspired terrorists now moving with impunity throughout the Sinai Peninsula's Bedouin tribes. These fanatical terror cells seek nothing less than achieving the introduction of strict Islamic law in Egypt, Africa's most populous Muslim nation. That might explain a recent crackdown on the tunnels from a somewhat surprising source; Egyptian President Mohammed Morsi of the Muslim Brotherhood, expected by most Gazans to offer them significant support, but who now appears shaken by the growing threat from Sinai and other major factors as he struggles to cling on to power. On Monday, the Times of Israel reported that Egyptian security forces had surprised border smugglers around the Rafah crossing by deliberately pumping water into tunnels, flooding them and making them vulnerable to collapse. This could be the first real indication that Egypt is responding to international pressure, Gaza-based political analyst Mkhaimar Abu Sada told the IPT. "It is true that the U.S. Congress is not happy with the situation happening between Egypt and Gaza," Abu Sada said, "and members of the U.S. Congress have been asking Egyptian secret services to take much more decisive measures to block the smuggling of weapons and explosives from Sinai to Gaza, and also to put an end to the tunnel business between Gaza and Israel. The Egyptian government will have no other choice but to do something to please the US and the international community, because at the end of the day if Egypt doesn't take decisive measures it will lose some of the international funding from the US and the Europeans." Many tunnel operators are getting worried. "I know for a fact that the Egyptians have been making it harder for the Palestinians to smuggle over the past two weeks" Abu Sada said. "It seems to me that the Egyptian authorities are trying to tell Gazans that commodities that are allowed to enter the strip from Israel must not be smuggled from Egypt into Gaza. They are only allowing commodities that are prohibited by the Israelis to come from Egypt to the Strip." If Israel unilaterally decided to double or triple the number of goods going into Gaza it would completely undermine large sections of the illegal tunnel economy. That, however, could prompt Hamas to renew its rocket fire into Israel that has been on hold since the end of the November's "Pillar of Defense" campaign. In short, Israel is damned if it does, and damned if it doesn't act on any increased in the transfer of goods to Gaza. "If Israel increased the number of trucks entering the Gaza Strip on a daily basis that would deprive Hamas and its government of collecting taxes and customs payments that are coming through the tunnels," Abu Sada explained. "The price the Palestinians in Gaza are paying for cigarettes and fuel is much, much cheaper than the price they used to pay when these came from Israel. For example, the price of gas [in Gaza] is currently one-third of what Palestinians in the Fatah-controlled West Bank are paying, and cigarettes are half of what Palestinians in the West Bank are paying." The tunnels generate $188 million in tax revenues on things like cigarettes and gas and building materials, Egyptian journalist Sarah A Topol wrote in the Bloomberg Business Weekly on Jan. 31. But "the smugglers say their importance is waning: Access to Israeli goods is improving, and the Gazan government has begun regulating [taxing] the tunnels, sapping profits." So, while the tunnels are essential for transporting illegal arms and materials into Gaza ready to wage war against Israel, they are also critical in maintaining the goodwill of poor Gazans by providing them with cut-price commodities, even with surcharges added by Hamas officials. "At the end of the day it is not only food and commodities that are entering the Gaza Strip, so it will be very difficult to close down the tunnels completely. These taxes and levies are essential to the economy of the Hamas government and will never be readily relinquished," Abu Sada said. Israeli officials have different views as to why Egypt doesn't fully open its border with Gaza and allow free movement of goods. The IDF officer, speaking to the IPT in late-January, suggested that the Egyptians simply want to keep the whole Gaza situation at arms' length, rather than take control of the issue. "The problem is that maybe then they would have to pay more attention, pay out more money, and take responsibility for the Gaza Strip if they prevent goods, people and other supplies going through tunnels. That is something they are not willing to do," he said. "They have determined that we, Israel, must do that. They do not want any part of the Palestinian problem on their shoulders. If they stop the tunnel industry they will have to open more border crossings and let more supplies in, and that they don't want to do." Israeli Foreign Ministry spokesman Paul Hirschson suggested that the idea that the tunnels were kept open for tax collection doesn't necessarily make sense. "Hamas runs the Gaza Strip," he said. "They could quite easily impose a tax system on goods coming across the border with Egypt. If Hamas were to get a deal with the Egyptians to pass goods on top of the border rather than under it, they could tax the goods as much as they want. But there are things going through the tunnels that wouldn't be allowed by the Egyptians anyway, such as drugs trafficking, human trafficking, and of course, arms trafficking." Gerald Steinberg, president of the Jerusalem-based NGO Monitor and a professor of political studies at Israel's Bar Ilan University is the author of 'NGOs, Human Rights, and Political Warfare in the Arab-Israel Conflict.' Steinberg has no doubt as to what is behind Hamas' tunnel strategy. "The Hamas leadership thrives on conflict and of portraying the situation in Gaza as one of Palestinian suffering. It is created for the Palestinian leadership by playing the victim card strongly and has been assisted in that by the NGO network and by the UN human rights frameworks all working together. They will always exaggerate claims that they cannot import basic materials, while at the same time seeking to downplay changes that will actually benefit the population. There is always a careful play off that Hamas does between allowing materials in [to Gaza] and playing the victim card." Steinberg characterizes the on-the-ground situation in Gaza in relation to the NGO's as one of dangerous and often willful misinformation by organizations funded, in particular, by pro-Palestinian European governments. The suggestion is that these groups have become politicized and are prepared to turn a blind eye to the highly incendiary issue of illegal weapons trafficking into Gaza in order to further their own agendas in support of their view of the downtrodden local population. Steinberg also feels that Israel has been guilty of being embarrassingly slow in presenting its case to the international community. "Part of the problem is the Israeli government's incompetence in countering these allegations issued by a powerful propaganda machine. The reason our organization exists is because there was no counterpoint. The Israeli leadership, until the last year or two, didn't understand that this was a major threat to national security. This isolation and boycott process was as powerful as a military process." Anat Kurz, research director at Israel's Institute for National Security Studies, agrees with Steinberg's view that NGOs are misrepresenting the situation in Gaza and are allowing themselves to be misled by Hamas. "I think it sounds quite logical" she told the IPT. "I think Hamas is treading a fine line, because if Egypt resorts to harsher measures with regard to the tunnels there will be greater or more vocal calls from the Strip by the people to allow the transfer of goods for daily use. Hamas will have to be more attentive to such calls. It depends on the systemic dynamic between Hamas, the Palestinian Authority, Egypt, what's going on in the Sinai Peninsula, and of course, Israel. There might be a change in light of developments on the ground."